When in Oklahoma City, you can experience the history and impact of the entire complex with an Oklahoma State Capitol Tour. Operated by the Oklahoma Department of Tourism and Recreation, Oklahoma State Capitol Tours are available for visitors, residents, school field trips, or other groups. Guided tours can be scheduled in advance, or there are brochures available to assist you on a self-guided tour. Trained volunteers take visitors on a 45-minute tour of the complex, giving pieces of fascinating Oklahoma history along the way, including the fact that it's the only capital with a working oil well on its grounds. The structure itself is of Greco-Roman architecture and includes 650 rooms. Take note of the marble floors and stairs, hand-painted ceilings, portraits of famous Oklahomans and other fantastic artwork, the newly added dome, and more. Outside is the Oklahoma Veterans Memorial, celebrating those who fought in World War I, World War II, the Korean War, and the Vietnam War. The capital complex itself has no restaurants, but there are snack bars located in the basement and on the fourth floor. These snack bars serve items such as candy, soda, and sandwiches. Take NE 23rd west and find several excellent restaurants such as Cheever's Cafe, Pizzeria Gusto, and Tucker's Onion Burgers. Also, a number of fast-food places are nearby, and the many restaurants in Bricktown or Midtown are only a short drive. The Oklahoma State Capitol is located at NE 23rd and Lincoln Boulevard. Take I-235 and exit eastbound on NE 23rd. Signs will guide you on to Lincoln Boulevard and to the parking areas. Administrators of the complex recommend the south parking lot for those scheduling capitol tours. Parking is free, but the area can get crowded when the legislature is in session. 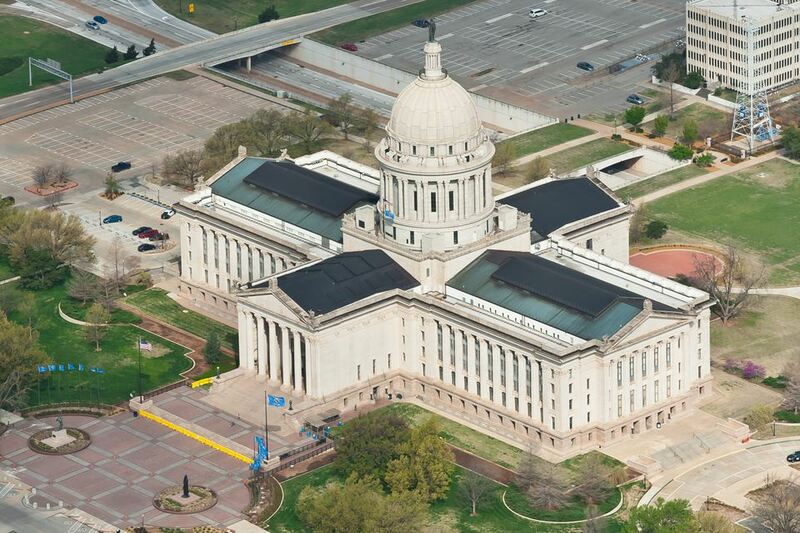 Admission to the Oklahoma State Capitol is free, and self-guided tours are available each day. It is best to schedule guided tours in advance by calling ahead. Tours begin at the Welcome Center in the first-floor rotunda.